An online Synaxaristes including martyrologies and hagiographies of the lives of the Orthodox Church's saints. All Forum Rules apply. No polemics. No heated discussions. No name-calling. "The opponents of Vladyka John summoned his enemies among the bishops to the trial: Archbishops Nicon (Rklitsky), Anthony (Sinkevich) of Los Angeles, Vitaly (Ustinov) of Canada and Seraphim (Ivanov) of Chicago. On the opposing bench with Archbishop John were Archbishops Averky and Leonty, and Bishops Savva and Nektary." Imagine that powerful lineup of senior Rocor Archbishops, including the future Metropolitan Vitaly ! It took a special courage for the more meager group of 2 Archbishops and 2 Bishops to confront them in that sizzling setting of a modern courtroom. When the newly elected Metropolitan Philaret seemed to side against the supporters of St John Maximovitch, called the Society of Laymen, Archbishop Averky's vigorous complaints were subdued, likely out of obedience and respect for the 1st Hierarch of Rocor. "In his first speech at metropolitan at the Council, the holy hierarch Philaret declared as regards the activity of the ‘laymen’ : ‘They will not frighten us,’ quoting Stolypin. After this the ‘laymen’ and their supporters among the hierarchs, in particular Archbishop Averky of Syracuse and Archbishop Leonty of Chile, were quiet for a time, but then their activity was renewed." For those who are curious to get a real life sense of this well-respected Rocor hierarch, 2 videos which include historic footage of Archbishop Averky by the Orthodox youtube channel "Gregory Decapolite" are below. I was reading up - a little, for I am not much interested in this prelate - Abp Theophan of Poltava and saw the surprising news that the young layman Alexander Taushev was the cell attendant of Abp Theophan. 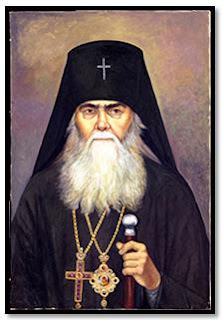 Thus, all three hierarchs and future hierarchs who had some interaction with Rocor during their careers were in Bulgaria at the same time : Abp Feofan, Bishop Seraphim [Sobolev], who appears to have been the Vicar of Feofan for awhile until Feofan's mysterious escape to Paris ; and the soon-to-be Fr Averky [Taushev]. Returning for a moment to the original 'miracle' story told by Zinaida N. in the earliest post on this thread, an incident occurred recently in Eastern Idaho which brings to mind the harsh reality of how dangerous it would be to lose a tire. One thinks of the occupants of that car. But what about other vehicles unfortunate enough to be in the path of the tire now on the loose - ? Below is an account of such an incident which was nowhere near as disastrous as it could have been. Perhaps Archbishop Averky or other righteous ones were also here in the Mountain States assisting to limit the damage ! "A van lost one of its wheels while heading south on Interstate 15 at about 12:50 p.m. Wednesday between Fort Hall and Blackfoot, according to local authorities. Cpl. Aaron Aikele with the Idaho State Police said the lug nut bolts holding the wheel onto the vehicle snapped, causing the tire to dislodge from the van. Aikele said the tire then bounced across the median and struck the front end of a northbound Buick sedan, causing significant damage to the vehicle's hood and windshield. Jacob Barney... witnessed the incident. Barney [said] that he didn't see the wheel come off the van but did see it barreling toward the car in front of him. "I saw it jump onto the interstate from the median, hit the car in front of us and fly about 100 feet into the air," Barney said. "Then it started bouncing along the freeway after that." What the Idaho State Police officer said about highway hypnosis certainly applied to Alla, the driver of the car in the spectacular save detailed in that 1st post. Why didn't either mother or daughter smell anything until the very, very end when the tire had detached itself ? Archbishop Averky had apparently prevented that tire from rolling anywhere ; one can see what really a blessing that was by this contrasting news account. Note : Whether from burning tire rubber or insufficiently secured lug nuts or any other cause, such tire mishaps remind one to have their own vehicle's tires checked frequently by a reliable place. Not just any chain oil change place, but a qualified, truthful mechanic. Preferably an older, more experienced one, not a kid, who may sound self-assured but not be so alert. One can not depend on holy figures to rescue one every time ! Beloved brothers and sisters in the Lord, you will hear these solemn and significant words in the Rite of Orthodoxy which the Holy Church has established to be served on this day. The first week of Holy and Great Lent has ended a week of intensified prayer and ascetical repentance. Now the Holy Church, desiring to encourage and console us, has established for us in this first week of Great Lent, on its first Sunday, a spiritual celebration, one most dear and close to our hearts - The Triumph of Orthodoxy. This celebration was first performed in 842 in Constantinople in the presence of the Blessed Empress Theodora by His Holiness Patriarch Methodius in memory of the overthrow of the last terrible heresy to shake Christ's Church, the heresy of iconoclasm. But in this celebration the Holy Church marks the triumph of the holy Orthodox faith in general, her victory over all impious heresies, false teachings and schisms. Our Lord Jesus Christ the Saviour founded His Church on earth so that all belonging to her could be saved, could elude the nets of the devil and enter into the Heavenly Kingdom prepared for them. The devil exerted all his strength to overthrow and destroy the Church of Christ and, through this, to hinder the salvation of men, At first he raised up terrible persecutions against the Church on the part of the Jews and pagans. For almost three centuries the blood of Christian martyrs flowed without ceasing. But the devil did not succeed in his task. The blood of the martyrs, according to the apt statement of the Christian apologist Tertullian, became the seeds of Christians. Christianity triumphed over its persecutors. The meek lambs of Christ's flock transformed the wolf-like rage of their persecutors into lamb-like meekness. But the devil did not resist after the defeat he suffered at the hands of the martyrs .When the Church of Christ triumphed in the world he raised up a new, even more dangerous persecution against her: from within the Church, as the Holy Apostle Paul had foretold in his conversation with the Ephesian presbyters: "men arose speaking perverse things". Paul called such men grievous wolves. [Acts 20:29,30]. These were so-called heretics who tried to pervert the true teaching of Christ concerning faith and piety in order to make this teaching ineffective for men. When this happened, the Holy Church, in the person of its best servants, took up arms against these heretics in order to defend its true, undistorted teaching. There began to be convoked first local and then ecumenical councils. Bishops came together from all the corners of the earth and through the Holy Spirit they gave voice to the pure and undistorted Truth, following the example of the First Apostolic Council of Jerusalem [Acts 15:6-29]. They also cut off heretics from the Church and anathematized them. This was in according with the clear commandment of Our Lord Jesus Christ Himself who said, If he neglect to hear the Church, let him be unto thee as a heathen man and a publican. [Matthew 18:17]. And in accordance with the commandment of the Holy Apostle Paul, that great apostle to the nations who said, But though we, or an angel from heaven, preach any other gospel unto you than that which we have preached unto you, let him be accursed [Galatians 1:8]. And in another place he states: If any man love not the Lord Jesus Christ, let him be anathema. Maranatha [I Cor. 16:22]. Thus our moving, majestic and solemn Rite of ORTHOD0XY takes its beginning from our Lord Jesus Christ Himself and from his great Apostle, called by Him to be the apostle to the nations, i.e. of the whole pagan world. From the ninth century on the Holy Church has established that this rite should be served on the first Sunday of Holy Great Lent and that it be named Orthodox Sunday. The rite, brothers and sisters, is particularly important and significant in the evil times we are experiencing, times in which the Orthodox : faith is wavering and shaking. This wavering and shaking of the Orthodox faith is due to those very persons who ought to be strengthening and supporting it in the souls of the faithful. Those who should be pillars of Holy Orthodoxy high ranking hierarchs including the heads of certain Local Churches are departing from the Truth of H0LY ORTHODOXY. It is terrible to have to say that even the head of the Constantinopolitan Church, which is known as the Ecumenical Church, the man considered to be the first hierarch of all ORTHODOXY, has set out this path! On all of this there undoubtedly lies the print of the Apostasy about which the Holy Apostle Paul foretold [II Thess. 2:3] the apostasy of Christians from Christ. We are now face to face with this Apostasy.The major threat to true Christian faith, the Orthodox faith, is the so called "Ecumenical Movement", headed by what is known as the "World Council of Churches", a body which denies the doctrine of the unity and infallibility of the True Church of Christ and attempts to create from all the presently existing and distorted the faith, a new false Church which, from our point of view, will without any doubt be the Church of Antichrist, that false church which the Antichrist, whose coming is now being rapidly prepared in the world, will head. From the teaching of the Word of God and the Holy Fathers of the Church we know that the Antichrist will be both the religious and political leader of all humanity: he will stand at the head of a new universal false church which the Antichrist, whose coming is now being rapidly prepared in the world, will head. From the teaching of the Word of God and the Holy Fathers of the Church, we know that the Antichrist will be both the religious and political leader of all humanity: he will stand at the head of the new universal false Church; he will also be the director of one new world government and will attempt to submit all to his absolute power. The Orthodox faith ” this is the faith of the Apostles, the faith of the Fathers, it is that faith which the Apostolic Fathers, the direct disciples of the Holy Apostles, and the Holy Fathers and Teachers of the Church and their lawful successors, established by the Holy Spirit, interpreted for us in their marvellous and inspired writings. Brothers and sisters, we must hold this faith steadfastly if we desire eternal salvation! Now we shall perform with you this deeply instructive, moving and highly solemn rite which consists of two parts: the first part is the prayer of the Holy Church for all those who have gone astray or fallen away from the true Orthodox faith; in the second part the Holy Church pronounces dread anathema against all false teachers, heretics and schismatics who have grown stubborn in their malice and who do not wish to reunite with the true Church of Christ but instead struggle against her. Then we shall sing Eternal Memory for all departed defenders of Holy Orthodoxy and Many Years for those defenders of the Holy Orthodox faith and Church who are still among the living.